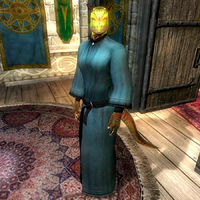 Druja, an Argonian battlemage, is an Apprentice of the Mages Guild who offers basic Mysticism training and sells spells at the Skingrad Guildhall. She lives a relatively drab existence, eating lunch from midday to 2pm, dinner from 6pm to 8pm and sleeping in her room on the ground floor from midnight to 6am. She will spend the rest of the day wandering around the Guild building. Her only remarkable task is that of locking, and subsequently unlocking, the main door. She carries it out dutifully every day at respectively at 8pm and 8am. When you meet her for the first time, she will greet you in her own special way: "What? Who are you? Oh... who cares. I'm Druja. You want something? Or you just practicing your Cyrodilic?" She is a bit indifferent about Skingrad: "It's a town, like any other. Well, go outside, and there's the mountains and wines and sheep. Here in town, though, nothing special." If you aren't already a member of the Mages Guild, she will tell you that "Adrienne can make you a member of the guild, if you can convince her to take her nose out of whatever book she's reading", but she's more excited about Adrienne's skill as a spell teacher, even though she agrees with her fellow members that Adrienne isn't the best chapter head: "Adrienne may read too much, but you should see the Summon spell she taught Vigge. He might teach you, if you're skilled enough." She probably refers to the Summon Storm Atronach spell, which you can indeed learn from him. Druja's selection of novice and apprentice spells is well regarded all over Cyrodiil. All the way down south in Leyawiin, guild member Alves Uvenim will have the following to say: "Druja has a wide variety of spells for sale, if there's something you need. Most of them are simple, but they're a good starting point." The residents of Skingrad are less effusive, but still admire her ability with the skill, commenting that "If you don't know much about Mysticism, Druja is a good person to talk to. She's at the Mages Guild" and "If I were in the Mages Guild, I think I'd study Mysticism. Druja was telling me a bit about it, and it sounds interesting." During the Recommendation quest she will point out Bleak Flats Cave to you on your map and comment about Adrienne's carelessness in forgetting its location. She wears the standard mage's robe and a pair of quilted shoes, as well as carrying a small amount of gold. She doesn't carry any weapons, relying instead on a set of basic spells from all of the magical schools. These are also the same spells that you can buy from her for a cheap price, since her Mercantile is only 6. She will always be available for training when not sleeping or eating. This page was last modified on 27 March 2013, at 17:51.